Yet in a wonderful twist of linguistic irony, Coffee House Press, whose publication of The Dig marks Jones’s debut on the American market, insists there is “no bucolic pastoral” in a novel undeniably having to do with a shepherd, Daniel, whose family has been farming sheep on the same patch of land in Western Wales for as long as anyone can remember. Of course the confusion involves the most popular contemporary connotations of “bucolic” and “pastoral,” which have both evolved over the centuries to signify any idealized portrayal of the countryside, or really anything having to do with an idealized countryside. It is telling that our language’s three most popular words for representations of rural life — “idyll,” from the Greek “short poem,” rounds out the trio — have become signposts for idealization and nostalgic veneration of the countryside. Few other genres descriptors carry such universally recognized judgment of texts — not “novel” or even “city novel;” not “lyric” or “ballad” or “science fiction” or “memoir.” Yet three words for “rural literature” do imply an assumption of idealization and with it, as in the copy for The Dig, a hint of scorn; the one word for rural literature that does not imply judgment — georgic — is barely used at all today. So writers have idealized and continue to idealize the countryside, and it’s easy to guess why: they are stuck indoors at their desks all day, typing or scribbling, while the sun shines and the grass grows and the rooster crows out of doors. They write about a shepherd or farmer’s physical freedom because part of them yearns for it. On the list of professions writers like to write about, farming might come in second only to writing itself; in Britain alone see Spenser, Wordsworth, and Hardy for just a few examples of literary farmers. In their zest for it they overshoot, writing only of country joys but not of country woes. Is Cynan Jones guilty of this literary crime, if it is indeed a crime? The answer is complicated. 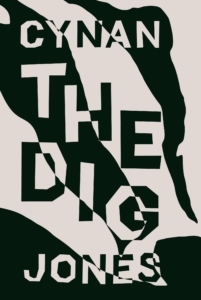 Jones certainly does not neglect to represent country woes in The Dig; human and animal tragedy provides a foundation for the novel, which opens with an unnamed “big man” disposing of a dead badger whose face has been chewed off by hunting dogs. Other items described in minute detail include (but are certainly not limited to) a dog’s neck slashed by a badger, a human skull bashed by a horse, and the severed second head of a grotesquely deformed lamb fetus. The point is blunt but piercing: nature hurts, and its creatures hurt each other. Jones’s “big man,” the less interesting of the two protagonists whose narratives weave throughout the book, has internalized this tough truth and perpetuates it: he baits badgers, training dogs to trap them in their holes and then digging them out to kill them. This activity is illegal in the UK, where badgers are heavily protected by law and public sympathy. As the novel progresses, local police cotton on to the big man’s badger digs and begin to investigate him: the hunter becomes the hunted. I did not much care about his impending doom; Jones gives us no reason to suspect that the big man can feel much for anyone or anything, with the possible exception of his favorite dogs. And he only cares for them insofar as they are skilled at hunting badgers. Yet Madding Crowd is actually less a pastoral than The Dig, for Hardy wishes just as much to instruct readers on the proper care of sheep as to make metaphors out of rustic lives. In one particularly gripping scene, he meticulously describes the steps required to save a fatally gassy flock by puncturing their rumens and letting the air whoosh out. Jones is less interested in such particularities, and anyway the compressed timeframe of the novel means we only see Daniel during lambing season, when his primary job is to help the new mothers along. We never witness him send his charges off to slaughter, though we know they are destined for the knife — in the dichotomous world of this novel, the big man is only the bringer of death and Da niel is only the giver of life. The lambing scenes, articulated in quietly beautiful language, describe sheep less for the sake of the sheep themselves than for grander purpose of making sense of the universe; they endeavor to “put the complex into the simple,” to borrow Empson’s definition of the pastoral. Certainly no creature is simpler than a sheep. But perhaps Jones has a different aim in mind when he writes of the profundities to be found in sheep farming. His urban readers — presumably most of them — might see a pastoral linking of big and small, of past to present, sublime to ridiculous (or, more precisely, disgusting). Jones’s rural readers likely interpret his sheep wisdom differently. Sheep are an inescapable part of daily life in Wales. When I spent a week in Aberystwyth, a university town a short way up the coast from Jones’s native Aberaeron, I got used to seeing them everywhere — atop the cliffs and in the valleys outside of town, of course, but also in occasional backyards of suburban-looking homes on the walk to the library, or perched against coastal hills so steep they looked stuck there with Velcro. When a breeze blew, you smelled sheep on it; the odor was unbearably strong after a rain. One spa in town — I am not making this up and have a picture to prove it — proudly advertised sheep placenta facials. For outsiders, a quick novelistic foray into pastoral life seems an obvious place to look for hidden profundities; for a people so surrounded by the look and smell of sheep, by their meat and cheese and viscera, it might be quite a surprise to imagine that sheep could have a higher meaning. Jones is writing for the Welsh farmer as much as he is for the English or American sophisticate, and his writing works best when it appeals equally to both groups.